With Russia’s armed aggression in Ukraine in spring 2014 and the ongoing political warfare against the West, frontline states like Lithuania are stepping up their defences. Along with the stationing of a NATO battle group, a boost in military spending and the re-introduction of conscription, a social and cultural campaign has been launched to raise the profile of Lithuania’s recent history of armed resistance to foreign rule. Specifically, the local insurgents who fought against the Soviet security forces from 1944 to the early 1950s – known throughout the Baltic states as the Forest Brothers – are being heralded as exemplars of patriotic valour and the leading force in the historical struggle for national independence. However, the effort to mobilize society through their example is also raising controversies inherent to the traumatic and complex experience of foreign occupation, collaboration and resistance characteristic of this part of Europe. Indeed, the history and historiography of the Forest Brothers is complex, and over time has evolved considerably under the influence of politics at the local and global levels. This article seeks to contextualize these debates within the politics of memory while reflecting on current concerns regarding political pluralism, social cohesion and collective security in the region. During the first Soviet occupation from June 1940 to June 1941, political manipulations, pre-emptive deportations and targeted police action eliminated even the potential for resistance. The Soviet re-occupation of the Baltic territories in 1944 quickly brought the cities under control, but a strong resistance movement emerged from the countryside. As the Germans retreated before the Soviet advance, thousands of Lithuanians took to the forests to launch a guerrilla war against Sovietization, a fight that would continue until the early 1950s. Similar resistance movements emerged in Estonia and Latvia, but the Lithuanian version was larger and more enduring, surpassed only by the insurgency in Western Ukraine. The Forest Brothers comprised enlistees from all walks of life. Most were driven by a patriotic desire to defend their homeland and to fight against foreign occupation. Some also feared being drafted into the Soviet army or felt they would be targeted by Soviet repression; furthermore, the ranks included some who had actually collaborated with the Nazi occupation. As Lithuanian historian Arūnas Streikus noted in an interview on Delfi.tv in 2016, scholarship has yet to produce a definitive portrait of the Forest Brothers and their motives, yet the subject is currently the focus of a new wave of intensive research in local academia, especially at the Department of History of Vilnius University. Thus far, studies estimate that at least 35,000 Lithuanians took part in this resistance over the course of the conflict. By some accounts, the Forest Brothers approximated a sort of underground national army, initially led by uniformed officers and troops subject to a disciplined chain of command. But the war after the war quickly transformed into the struggle by irregular partisans against an occupying power that was systematically extending its authority from the cities to the countryside. The strength of the Lithuanian resistance lay not in its numbers or equipment, but in its privileged relationship to the countryside and its rural communities. Intimacy with the terrain gave them speed, agility and the advantage of surprise, allowing them to obstruct and delay, but not defeat, a much larger and better-organized force. From 1945 until about 1947, the villages of Lithuania were liminal zones of mixed and incomplete authority. As the Forest Brothers would not be drawn into direct and open battle, the Soviets resorted to what Stathis Kalyvas calls ”selective violence”, i.e. the targeted elimination of certain individuals based on information stemming from denunciations and the collaboration of the local populace. The Soviets appointed villagers to local administrative positions, and organized them into militias and special squads (istrebiteli in Russian, stribai in Lithuanian) to fight the insurgents, to infiltrate the resistance and to kill its activists. The terror of violence was never far away, as the bodies of murdered partisans, often mutilated, were routinely laid out for all to see on the street, in front of police headquarters, market squares, schools and churches. 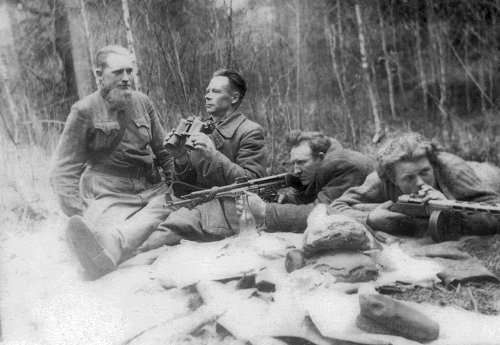 The Forest Brothers would also fight for the hearts and minds of the rural population, with positive appeals to national patriotism and the duty to resist the occupation, as well as threats and reprisals against those collaborating with the Soviets. By the late 1940s, the Soviets launched a full-scale offensive to implement collectivization and eliminate the insurgency. Two major operations in 1948 and 1949 resulted in the forced deportation of almost 70,000 farmers and their families from the Lithuanian countryside. Collectivization, which stood at just 4 per cent at the beginning of 1949, rose to 65 per cent by the end of the following year. Soviet power had finally reached from the major cities to the small villages. While small groups of insurgents would continue to fight into the 1950s, the social, organizational and material base of the resistance had effectively been destroyed. The physical destruction of the resistance was followed by its repression in discourse and memory. The fact that some anti-Soviet guerrilla fighters had collaborated with Nazi Germany to help preserve Lithuania’s independence, and in some cases even participated in the Holocaust, was exploited by the Soviets in the media, popular films and tendentious historical accounts to taint the entire movement as criminal. Although memories of armed resistance against the Soviets was not ultimately eliminated, it was repressed, distorted by propaganda and obfuscated; it managed to survive in tightly-knit communities within the country and abroad among émigrés, but with little opportunity for Lithuanians to thoroughly analyse and process this difficult period of history in an open and transparent fashion. This situation prevailed until the late 1980s, when Gorbachev’s policy of glasnost’ opened the door to the disclosure of previously hidden information and an unrestrained discussion of the past. In Lithuania, however, this “return of memory” focused first of all on the victims of Stalinist crimes, with emphasis on the traumas suffered by innocent deportees and on the political repression and persecution of the non-violent dissident movement and the Catholic Church. Large-scale public rituals commemorated these losses, including the reburial of remains returned from the distant reaches of the Soviet network of prison camps or deportee settlements. The mass deportations were highlighted as an integral component of Soviet plans for the genocide of the Lithuanian nation, a term that quickly gained currency in public discourse. During this period, as the narrative foundations of post-Soviet Lithuanian identity were being laid, the partisan struggle was present but not especially prominent in the overall accounting of suffering. Several partisan memoirs were published and circulated, but not nearly as many as those written by former deportees. The prevailing image was that of a nation of victims and fighters, with an initial emphasis on the former. Accordingly, the „Museum of Genocide“ was founded in 1992 (with the word “genocide” referring to Soviet crimes against the Lithuanian nation), and it was only in 1997 that the museum was turned into a full-scale research centre and given the more inclusive name of „Genocide and Resistance Research Centre“ (Lietuvos gyventojų genocido ir rezistencijos tyrimo centras, LGGRTC). A key motivation for raising the profile of anti-Soviet partisans in the national memory was to emphasize the illegitimacy of Soviet rule by citing the existence of a universal, organized and armed resistance as testament to the continuity of the Lithuanian state. Commemoration of the post-war struggle became more prevalent as a consequence of geopolitical developments. In 2009, a year after Russia invaded Georgia, and seized some of its territory, the Lithuanian parliament proclaimed Jonas Žemaitis as the fourth President of Lithuania, a partisan leader who established the aforementioned Movement for the Struggle for Freedom of Lithuania and survived in hiding until 1953. The same year saw a number of initiatives to criminalize slander of the Forest Brothers. But it was not until the Russian invasion of Ukraine in 2014 that post-war resistance took on a primary role in Lithuanian public memory. Russia’s systematic demonization of the Ukrainian authorities as a fascist junta and the leading role of Ukrainian volunteer fighters in a national campaign of self-defence invoked parallels to Lithuania’s past. 2014 was also the year when the resistance gained cinematic tribute. The Invisible Front, a documentary on the Forest Brothers directed by Jonas Ohman and Vincas Sruoginis, was screened alongside American blockbusters at mainstream Lithuanian theatres. The focus of the film is the heroic struggle and self-sacrifice of Juozas Lukša, a partisan leader who escaped to the West in 1947 with the aim of raising support, and returned to Lithuania in 1950 only to be captured and killed by the Soviets. The film had a strong popular reception in Lithuania, where it was enhanced by popular campaigns like “Thank you, Forest Brothers”, whereby Lithuanians were encouraged to wear green bracelets to demonstrate their gratitude to the anti-Soviet resistance – a trend that spread quickly throughout the country. The last two years have witnessed an upsurge in film and TV productions, publications, discussions and organizations focused on restoring and popularizing the memory of the Forest Brothers. One example is Trakiniu Partizanai a public initiative launched and promoted by a group of young activists, including historians from Vilnius University, whose aim is to popularize the memory of the resistance through festivals, discussions, lectures and historical re-enactments. According to its mission statement, this initiative seeks to develop the „open-minded, critically thinking and patriotic“ youth in Lithuania. Indeed, the History Department of Vilnius University prides itself on the new cohort of young doctoral students and researchers at work on this topic and seeking to fill in the gaps of knowledge concerning the everyday lives of Lithuanian partisans, their social composition, leadership, etc. Not surprisingly, efforts to raise the profile of the anti-Soviet partisans in public discourse have been punctuated by reflections on the dark side of any significant armed struggle. In the current context, such reflections have been the source of noisy public scandals. In July 2017, Darius Udrys, a public relations professional and head of Go Vilnius, an official development agency for the Lithuanian capital, was fired from his job after a very brief tenure in office. Ostensibly motivated by performance issues, the Mayor’s decision is difficult to appreciate in isolation from the noisy political campaign waged against Udrys for his critical reflections on the Forest Brothers. The reaction from certain quarters of the public was swift, stormy and negative, and not only on social media. Within days, a public campaign was set in motion, which was led by representatives of the conservative Homeland Union party and insisted that he be dismissed from his job on the grounds that individuals who do not understand or who misrepresent their country’s history should not hold public office. At issue was the known and accepted fact that as the Soviets extended their reach and used collectivization as a means of breaking the bond between the partisans and their networks of support in the villages, the Forest Brothers threatened their fellow Lithuanians with reprisals for collaboration with the occupational forces. As in every war, the battle for the hearts and minds of the population was a key to victory, and the Forest Brothers followed through on their threats. According to Mindaugas Pocius, a Lithuanian historian and author of “The Far Side of the Moon” (Kita mėnulio pusė), an extensive study on the reprisals, over 9000 civilians – including no fewer than 300 children – were designated as collaborators, court-martialled and executed by the Forest Brothers. The matter in dispute concerns not whether such reprisals occurred, but rather the numbers involved, the reliability of the Soviet judicial and archival sources on which many of the calculations were based, the circumstances and extent of such occurrences, and which factions of the anti-Soviet resistance employed such measures. The publication of the book in 2009 ignited controversy and heated debate. Pocius was accused of uncritical reliance on Soviet archival sources and brutal slander of the partisans. Among many voices of outrage, a critical letter was sent to the president, prime minister and speaker of parliament, and a complaint was lodged with the state prosecutor, urging a criminal investigation into his work and alleging an intent to distort and revise Lithuanian history. The prosecutor found no grounds for an investigation and the story faded from view, but the attacks produced a chilling effect on professional scholarship addressing this topic. To this day, Pocius’ book is the only monograph addressing this thorny matter. Indeed, one powerful reason why public discourse on partisans is so heated, and why professional discourse is so cautious, is the pointed and ever-present legal ramifications of the question. Until the mid-1990s, several years after the collapse of the Soviet Union, some former anti-Soviet partisans were still reluctant to acknowledge their membership in armed formations, the legality and legitimacy of which was only recently restored. Moreover, in 1997, the state established a special investigation unit under the auspices of the LGGRTC to look into crimes against humanity, genocide and war crimes and to work closely with the Prosecutor Generals Office. Historical studies citing the involvement of any party in atrocities can serve as evidence to compel judicial bodies to open criminal investigations against the alleged perpetrators. Over and above disputes of law, archival sources and narrative ethics, today’s political stakes of the partisan issue concern whether the darker aspects of the armed resistance struggle should prevent the elevation of the Forest Brothers to the pantheon of Lithuania’s highest statesmen, alongside the signatories of the Declaration of Independence of 1918, the leaders of the non-violent, anti-Soviet movement of the late Soviet period and other iconic national heroes. For example, the Lithuanian Parliament is currently considering whether to dedicate the year 2018, the one hundredth anniversary of Lithuanian independence, to the memory of Adolfas Ramanauskas-Vanagas, a former partisan leader born in 1918, in recognition of his heroic defence of Lithuanian sovereignty against the Soviet occupation. And in the midst of these deliberations, the Lithuanian writer and media celebrity Rūta Vanagaitė during a TV interview made the sensational declaration that Ramanauskas-Vanagas, who was brutally tortured by KGB interrogators in 1956, had not only possibly participated in the Holocaust but had collaborated with the KGB as well. Vanagaitė had earlier gained local notoriety and international recognition for her best-selling, popular expose of Lithuanian participation in the Holocaust, entitled „Our People“ (Mūsiškiai) and published in 2016. The book provoked heated discussions. On the one hand, it was harshly criticized for its uncritical use of Soviet sources and sensationalist style. That said, it was also widely praised for drawing widespread attention to place of the Holocaust in Lithuanian history. Vanagaitė based her comments about Ramanauskas-Vanagas on Soviet interrogation records. But the evidence she referred to was already known to local historians and, in their assessment, was doctored, as were many (though not all) of the materials provided by the Soviet prosecutors to the Stalinist courts. Vanagaitė subsequently apologized and retracted her comments in an open letter widely publicized, but not before a wave of popular outrage prompted her publisher to withdraw all her books from the shelves, including Mūsiškiai. The publisher’s decision prompted the European Jewish Congress to sound a note of alarm that resonated in the Israeli and German mass media. Meanwhile, Lithuanian commentators and ‘memory activists’ accused Vanagaitė of waging a memory war against Lithuania, rehashing Soviet propaganda and defaming the heroes of the Lithuanian national movement through indiscriminate accusations of participation in the Holocaust. The scandal subsided after Vanagaitė’s apology, but the entire episode has, once again, brought a complex and painful issue to light; namely, how many and precisely which members of the anti-Soviet resistance took part in atrocities. In recent years, some high-profile partisans such as Antanas Baltūsis-Žvejas and Jonas Noreika have had their participation in the Holocaust exposed, even while efforts were underway to recognize their contribution to the defence of the nation. For example, in the town of Ukmergė, the local community is still debating what to do with the memorial that had been erected to Juozas Krikštaponis, a partisan leader whose direct involvement in the Holocaust has been established by Lithuanian historians. The elevation of the anti-Soviet resistance fighters as the highest moral authority is widely, but not universally accepted in Lithuania. For example, in 2015, a group of historians researching the history of partisans in the north-western corner of Lithuania proposed that the Obeliai Gymnasium, located in the area, should be renamed in honour of Balys Vaičėnas, an anti-Soviet partisan leader whose memoirs had recently been discovered and published. The school authorities conducted an anonymous poll among the local community, including parents and teachers, and found that a majority was against the proposal. NATO’s recent production of a short documentary on the anti-Soviet resistance brought the debate over the Forest Brothers back to its Cold War origins. Featuring interviews with former members of the anti-Soviet resistance in Estonia, Latvia and Lithuania, „Forest Brothers – Fight for the Baltic“ draws a sympathetic link between the anti-Soviet guerrilla struggle for independence in the post-war era and the threats currently facing the armed forces of the three Baltic states. Intended to promote a sense of Allied cohesion in the face of Russian revisionism, the film was much appreciated in the Baltic states as a sign of international recognition of their historical struggle for independence and of their determination to preserve their sovereignty in the face of looming threats. The example of the individual who stands up for the community in its darkest hour, who sacrifices his or her life and livelihood, taking up arms in the face of impossible odds, provides a powerful and arguably essential example of citizen and statesmanship. However, for the deeds of the Forest Brothers to serve as an ethical and political compass for the current times, it is essential that this period is addressed lucidly and in its full complexity. One simply cannot afford to mythologize, whitewash or forget the dark and perhaps unavoidable side of any armed struggle. Attempts to avoid or silence uncomfortable questions only provide ammunition to Russian propaganda seeking to undermine the broader and more important narrative of national self-determination in the former Soviet space. The Russian critique of the NATO representation of the anti-Soviet resistance in the Baltics was manipulative in the best tradition of Soviet propaganda, but unless scholars and citizens are able to engage in an open and unconstrained discussion of the most controversial aspects of this historical phenomenon, the legacy of the Forest Brothers will remain vulnerable to sweeping allegations and unwarranted attacks. Alexander Statiev analyses the Soviet use of collectivization and agrarian policy as a means of pacifying a rebellious rural population in Chapter 5 of his book: The Soviet Counterinsurgency in the Western Borderlands, Cambridge: Cambridge University Press, 2010, pp. 139–163. See Stathis N. Kalyvas, The Logic of Violence in Civil War, Cambridge: Cambridge University Press, 2006. Lietuvos respublikos įstatymas dėl lietuvos laisvės kovos Sąjūdžio tarybos 1949 m. Vasario 16 d. Deklaracijos (12 January 1999) No. VIII-1021, Vilnius, retrieved 25 October 2017, URL: www3.lrs.lt/docs2/IALZIQEE.PDF. Vasilijus Safronovas, Coming to Terms with the Dictatorial Past: Rising of Conservative Trend in Contemporary Lithuania, Studia Universitatis Cibiniensis. Series Historica, vol. XI Supplement (2014): 133–162. Mindaugas Pocius, Kita Mėnulio pusė: Lietuvos partizanų kova su kolaboravimu 1944–1953 metais, Vilnius: LII leidykla, 2009. See my own interview with the author at the time: Violeta Davoliūtė, Kita mėnulio pusė – partizanų kova su kolaborantais [Interview with Mindaugas Pocius], lrytas.lt (30 September 2009), retrieved 17 November 2017. See Påhl Ruin, The Forest Brothers – Heroes and Villains of the Partisan War in Lithuania, BalticWorlds (25 October 2016), retrieved 17 November 2017. For a discussion of the debates around this book, see Ekaterina Makhotina, We, They and Ours: On the Holocaust Debate in Lithuania, Cultures of History Forum (27 September 2016), retrieved 17 November 2017. Norbertas Černiauskas in the radio programme „Kita tema“ [a different topic] (9 August 2017), retrieved 25 October 2017. George Orwell, As I Please, Tribune (4 February 1944).